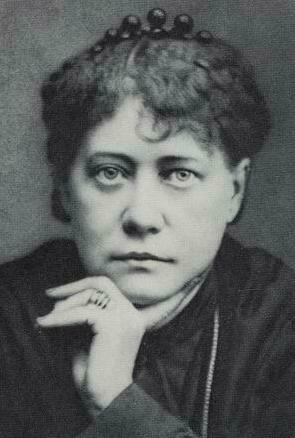 This story by revered Madame Blavatsky is certainly a masterpiece in all aspects be it philosophy, literature, history, psychology, mysticism, religion & above all, music. It seems that this short story stemmed from one of the Madame’s nightmares. There are many themes, personalities & topics that consist of this masterpiece of literature which does not in the least stagnate the horror story, but only accentuates it to a crescendo, quite in keeping with the musical theme of the narrative. More than anything else however, the main theme of this story is ‘passion’ … passion that makes a person either rise to the summits of the highest mountains of heaven, or sink into the cauldron of hell itself. It is passion that makes Franz Stenio the young violinist to rival with the great musician Paganini ; it is passion for the beauty of the sound of the violin that makes Franz play to the imaginary onlookers he terms as the very gods & goddesses of Greece ; it is passion that makes Franz believe that he can rival the music of Orpheus’ lyre (Orpheus was a legendary musician, poet, and prophet in ancient Greek religion and myth); it is passion for fame & brilliance that makes Franz challenge Paganini to a sort of violin duel; it is the passion for mortal acclaim that Franz in desperation uses the intestines of his beloved adopted father Samuel Klaus to string up his violin BUT most of all, it is the passion for music itself that leads Franz Stenio to his ultimate doom for as the story rightfully shows, love always comes before perfection & adulation. Indeed it was strangely the holy & righteous love of Samuel Klaus which lead to the ultimate end of Franz Stenio, the main character of this story. The story by Madame begins with the arrival of Franz & his adopted father & teacher Samuel Klaus to the city of Paris. They start living in humble quarters & Samuel tries to bring up the career of his adopted son. Unknown to the devoted father of course is the past history & psychology of his pupil. The pupil, Franz Stenio is of a disposition most rare. He was brought up the narrative shows as a typical Styrian of those days (alluding to the years before 1828) surrounded with superstitious lore concerning ghouls, vampires etc. as well as being a dabbler in ceremonial magic, sorcery, occult arts & alchemy. The student however has little to do with these practices, his time, energy & soul being totally devoted to music, especially his violin. The ‘violin’ itself to me seems like a real life character in this story. There have been many demonic stories & legends concerning the violin in general which are also mentioned in the story. 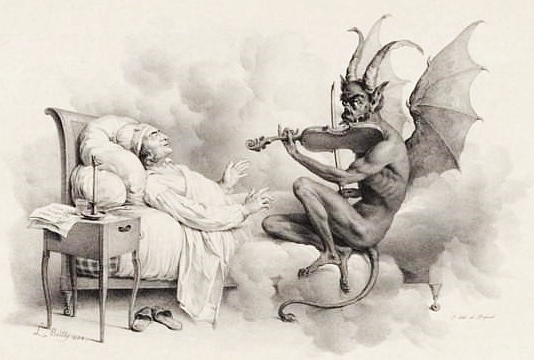 Madame has mentioned rightly, the legend of the famous Tartini & his famous ‘Sonate du Diable’ which according to folklore was actually played on the violin by the devil himself to Tartini while the latter was asleep. The composition till date as Madame mentions remains a most unusual one which people consider to be the consequence of Tartini’s bargain with the devil. 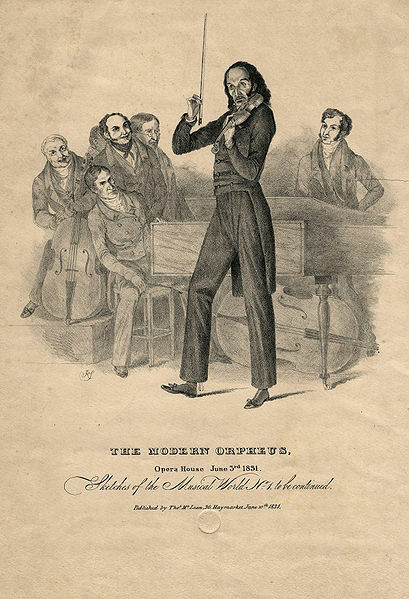 Paganini who is also a main character in this short story of horror is also mentioned to have strung his violin with the intestines of a very dear friend who loved him very much, thus his playing drove people into a sort of musical ecstasy or frenzy. Black magic plays a very important role here in this narrative indicating how through the black arts, human organs are used as powerful magical agents. Franz Stenio however is unawares of this aspect of the black art & continues to play his violin. When his money runs short, he returns to his mother who is a firm Christian & is appalled with the knowledge that her son does not go to church. She unfortunately as the story goes dies in bed of a chill while trying to supplicate heaven to bring back her son to the church. After this, Franz lives a Bohemian lifestyle only playing to the Greek gods until his tutor finds him. This tutor is none other than Samuel Klaus who beseeches his pupil to give up his current state of life & become his son. It is at this point of time something very important takes place. For a long period of time, Franz was not really interested in worldly glory for his playing … it is Samuel Klaus his teacher who reawakened in his pupil this desire which ultimately leads to his doom, just the way the love for fame & glory without humility always leads to one’s doom. Note that though during Franz’s three month lifestyle after his mother’s death he spent his life like a bohemian, he was genuinely happy. He in fact as the narrative states was leading a life full of bliss … until the greed of fame entered into his mind. The evil of greed therefore is highlighted in this most extraordinary story. The story goes on to show how adopted father & adopted son travel through several German cities & earned praise but when they reached Paris, they were hindered in their course of work by a musician of unparalleled excellence, Niccolo Paganini. The arrival of this rival sets the tone of despair in the hearts & minds of Samuel & Franz who were the worshipers of fame. They realize for themselves at a concert after pawning their watches to buy tickets that it was true … Paganini was a much better player than Franz Stenio. However, Samuel Klaus makes his fatal mistake by stating that Paganini’s talent was not of this world & that he had made a pact with the devil to play so well. Furthermore, Samuel also informed Franz of the theory of human intestines being used as strings for Paganini’s violin. Possibly, the tutor was only trying to make Franz feel better & not to let his wounded pride fester indicating to him indirectly that at least Franz was not a devil worshiper. However, instead of making Franz feel better … it literally drove Franz insane. A sinister look immediately came upon his face as it does on someone who is desperate. Franz immediately declares to his adopted father that to gain human adulation, he too would be willing to sell himself, body & soul to the evil one. Here, Madame shows us how the craving for human glory can derange a person’s mind & indirectly recalls to our mind how only humility & simple day to day living can only make us true free citizens away from devilish & evil bondages. Franz immediately goes into a sort of brain fever & is cared for by his loving tutor Samuel Klaus. During this time, Franz starts to rave aloud, indicating that he would only become a great musician if he managed to string his violin with the intestines of his beloved tutor for human intestines was not all that was important as legend goes … it is important also that those intestines should have belonged to someone who had loved the violinist with an unselfish & holy love. We do however realize that Franz does not want to kill Samuel that’s why he feels like a prisoner. In the narrative, Franz describes himself as Prometheus (the Titan god of forethought and crafty counsel who was entrusted with the task of molding mankind out of clay) whose arms & legs are bound with the four strings of the violin … made of intestines. All this & much more is heard by Samuel which brings out two other aspects of this story that surpasses pride, self-glory & fame … these are love & sacrifice. Madame shows here how unselfish true love can be & one cannot ignore the choke in ones throat after reading the above immortal line. Yet, fooling with the devil is not wise & this leads to the untimely & horrific death of Franz. Indeed Franz strings his instrument with the intestines of his beloved teacher & even challenges Paganini to a violin duel. However, before the duel, Franz grows restless & queer. The devil seems to be acting up & tries to force Franz in the voice of his teacher FROM THE VIOLIN BOX to unstring the intestines. 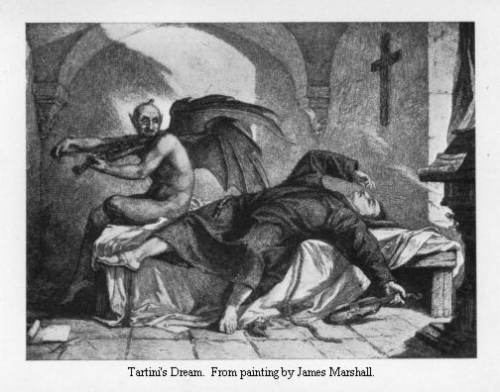 Franz refuses to do so forgetting the legend of Tartini who apparently according to his teacher died one fine Sabbath night, strangled by his familiar demon who had taught him how to endow his violin with a human voice (Tartini died on February 26, 1770 after a long illness it is officially recorded). Whether it is really the sarcastic voice of Samuel’s spirit or a devil, no one would know for immediately Franz is killed on stage after being surrounded by a grey mist. This story is full of meaning & has a lot of moral depth. It shows us how one simply can lose oneself in one’s own ambition. It also shows us how great literature can really be written. I salute Madame.